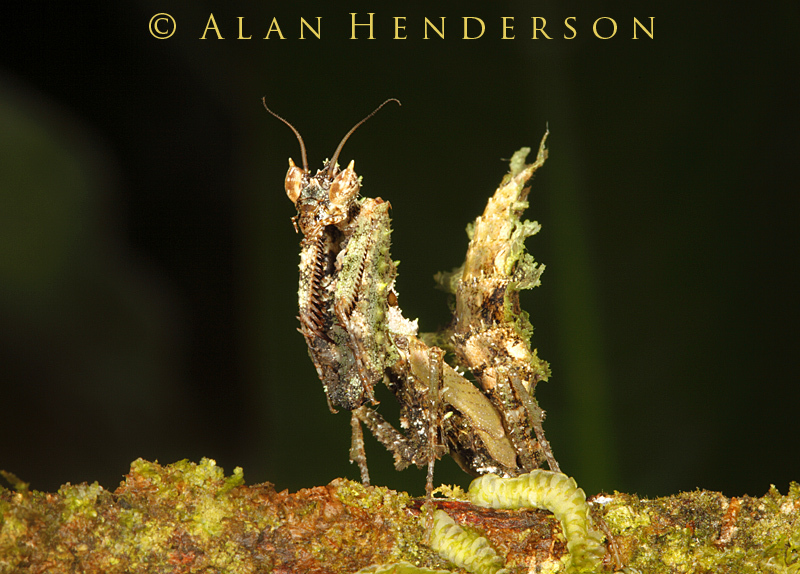 One of most amazing invertebrate encounters so far is the discovery of this ‘moss mantis’. We were looking for mantids in a patch of primary rainforest, but I didn’t expect to spot something as bizarre as this. I noticed a piece of moss hanging below a branch about five metre off the side of the trail we were on, but something struck me about its shape. When I stepped closer I thought I could make out a leg, then another, and once I spotted the antennae I knew I was looking at something pretty cool. The 'moss mantis'. 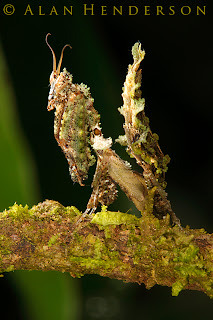 One of the most amazing mantids I have ever seen. 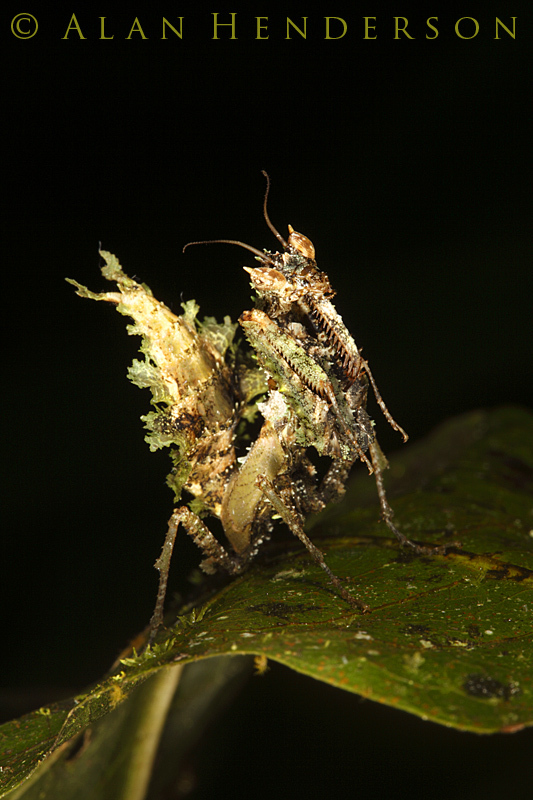 We haven’t identified this species yet, but it is truly a master of camouflage. 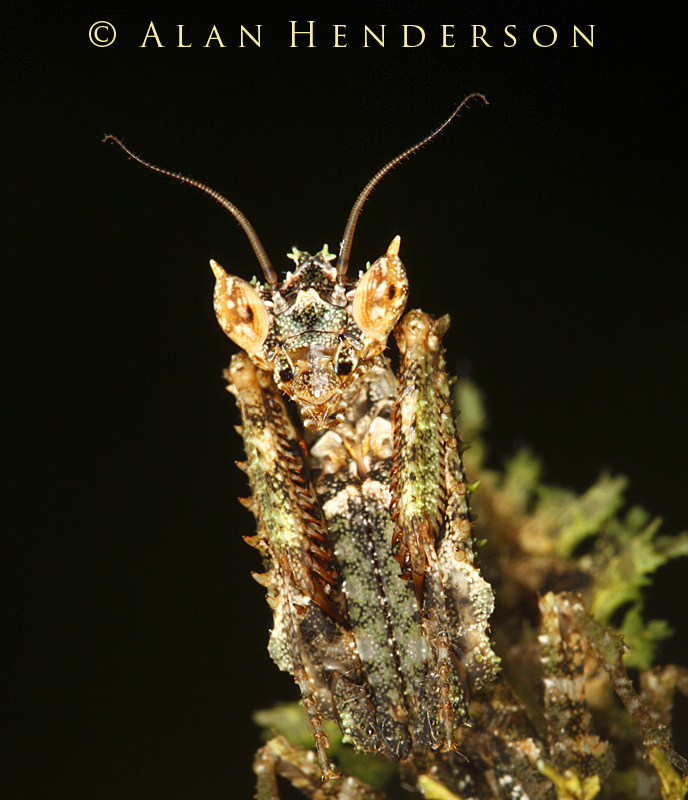 It has the combined features and colours of moss and lichens which serve to hide its body form, and the result is stunning. I am quite amazed that I spotted it, even with years of experience in looking for such things. This species is covered in bumps and flanges which look incredibly like lichens and mosses. Being a mantis it is naturally a predator, and one with complete ambush on its side. When it moves it rocks from side to side in very pronounced manner, just like the mossy tendrils hanging below the branches in its habitat. This enables it to move from one place to another without attracting the attention of predatory birds, lizards and frogs. Even the eyes are superbly disguised. All I can say is WOW! Some (not quite as exciting) news from Sth Oz... the Lion Huntsman you sent last year has made an egg sag and is sitting in her nest guarding it zealously. Unfortunately she was not mated but its exciting none the less! 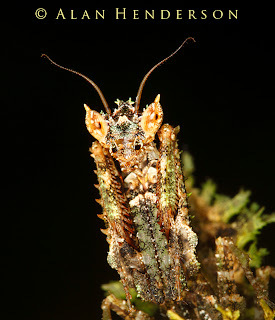 Genus is Pseudoacanthops. Let me know if you figure out the species!